Once the Texas Trail Roundup is sanctioned ans an IML — a premiere international walking event — we expect to host visitors from all over the world. Yikes! How are we going to communicate with everyone? The trails themselves will be clearly marked — each distance will have a unique color marker on the trail so that walkers can follow the route without written directions. On pages with a sidebar — essentially, every Texas Insider Blog entry — you will find a small dropdown menu that asks you to select a language. Once you pick your preferred language, the entire web site is translated except, of course, for graphic images and pdf files. 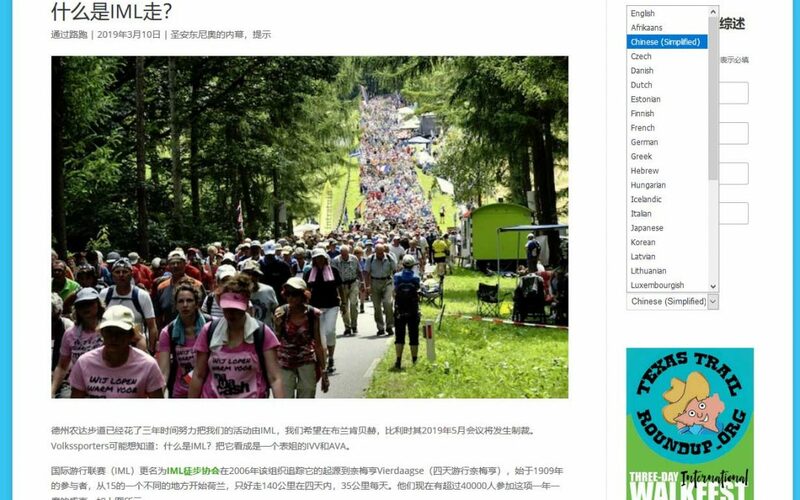 The image in the header shows a blog entry translated into simplified Chinese. Important: to revert to English, you have to go back to the dropdown menu in any page with a sidebar and select English as your language. We have people around the world checking this out to make sure it meets the needs of international walkers who may not speak English. Once we work out any bugs, we’ll make this feature more prominent. For now: what do YOU think? Or, as they would say in Germany, Was denken Sie?